The overarching goal of the project is to better understand how and why monarch populations vary in time and space, with a focus on monarch distribution and abundance during the breeding season in North America. Commit to monitor regularly - If you have access to a site in which milkweed grows and that you can monitor regularly, we encourage you to monitor this site on a weekly basis during the time that milkweed is present. 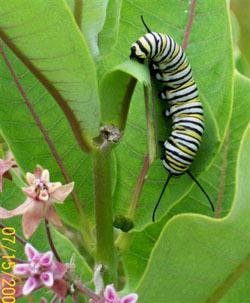 You will register as a Monarch Larva Monitoring Project volunteer, and provide detailed information about your site. Submit anecdotal observations - If you don't have the time or an available site to monitor regularly, we would still like to know about any observations of monarch eggs or larvae that you make. This method of participation is also for regular volunteers who may observe monarchs at locations other than their regular monitoring site. Where ever Milkweed can be found. Data sheets and Field Notebook: You will need at least one copy of each datasheet, and possibly more depending on the number of weeks you monitor. A field notebook (journal type or spiral-bound) is also useful for recording other observations that don’t fit on the data sheets. Hand lens: A hand lens or magnifying glass is very useful for identifying eggs and small larvae. Meter stick or measuring tape (for measuring milkweed density): You will need a meter stick only once during the season. Rain gauge (for Activity #2): If you can, mount an inexpensive rain gauge at your site. Try to find one that is designed to prevent the water from evaporating. Thermometer (optional): Mount an inexpensive outdoor thermometer at your site, or bring one when you visit the site to monitor each week. Field guides (optional): To identify monarch eggs and instars, use A Field Guide to Monarch Caterpillars or our condensed version, the Larval Field Guide, on this website. A guide to wildflowers is useful for identifying the blooming plants at your site. Containers for rearing larvae (for Activity #3): See Instructions for Rearing Larvae for more information.